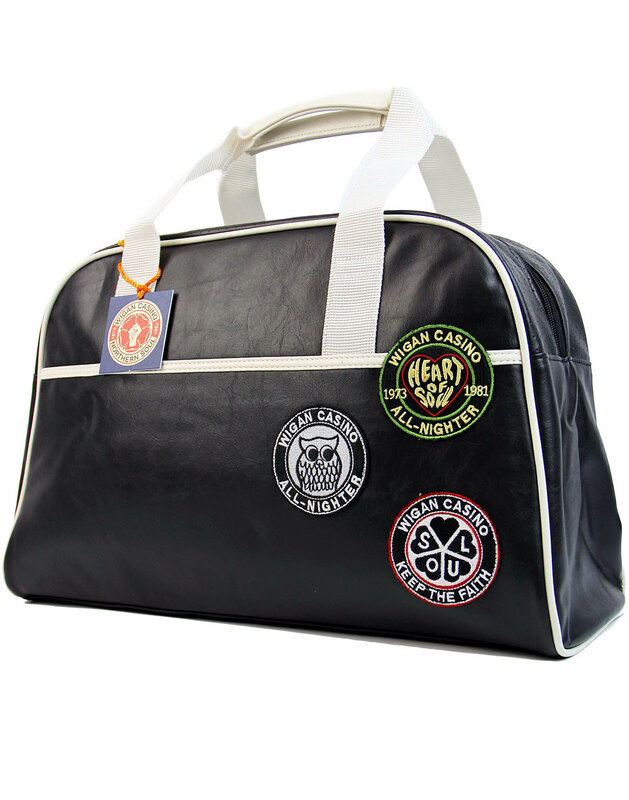 Wigan Casino Northern Soul Mod Bowling Bag in black. Between 1973 and 1981 one of the most popular and iconic club nights in the whole of the UK could be found at the Wigan Casino. The club championed the northern soul counter culture including the music and fashion it created. This classic Retro bowling bag is a celebration of the magic of Wigan Casino and the many nights that were enjoyed there. Three iconic Wigan Casino patches; 'Heart of Soul', 'Owl All-Nighter' and 'Keep The Faith' decorate the front of the bag. Contrast white carry handles and piping trim enhance the classic mod design. Practicality and style combine to make this Northern Soul bowling bag the perfect Mod accessory for your next all nighter. - Wigan Casino Northern Soul 70s Mod Bowling Bag. - Iconic Wigan Casino 'Heart of Soul' patch to front. - Wigan Casino Owl All Nighter patch to front. - Iconic Northern Soul Keep the Faith Soul patch to front. - Black bowling bag with white trim and canvas carry handles. - Commemorative Wigan Casino '73 to '81 Logo On Inside. - SKU: W2096 Wigan Casino Bowling Bag. Approximate dimensions: 46cm x 29cm x 12cm.